How easy is it to take your randonneur or touring bicycle on a train? If the cycling press in Britain is to be believed, not that easy. You need a ticket for a non folding bike and even with that, space is limited and a ticket doesn't guarantee it will travel on the train you believe you are expecting to travel on. Train travel in Britain is awkward and very expensive when compared to other European countries. France is very different. If you are travelling through Paris, there is no central railway station. You can check via the SNCF website before you go to France to get some idea of which Paris railway station you need to travel from. Train travel is cheap and the electric trains very efficient. Most of the Grand Lignes express style trains I travelled on did not stop for the first hour or so of their journey. The destination board at the platform ends will list the stops, so if the station you intend to travel to is listed, it will stop there. You will require a ticket for your bicycle, whether on the TGV, Grand Lignes or the local trains. There are limited places on the TGV trains, but so far I have not had a problem and that includes travelling on a French public holiday. The local trains of the Nord-Pas de Calais have bicycle racks in one carriage in the multiple unit, very much like Translink in Northern Ireland. The carriage has a large bicycle icon on the outside, so it is easily seen. You are expected to move quickly onto the train as the trains are very punctual! The local trains I travelled on in Nord-Pas de Calais were of the double deck carriage type, with the bicycle racks in one corner of the carriage. The bikes are suspended and hang by the front wheel. Again bicycle space is limited, but the service is frequent, so if no room on one train, there should be on the next one. 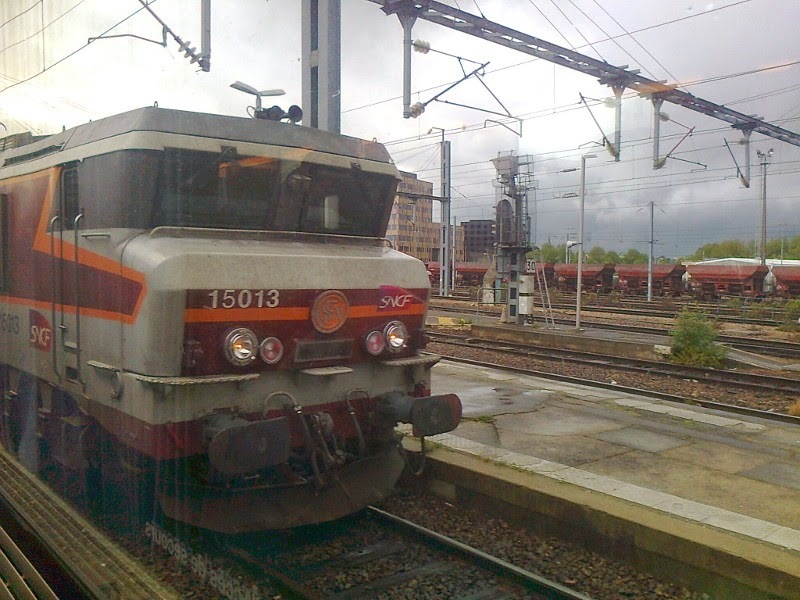 The TGV service south to Paris Gare du Nord from Valenciennes was the next service that I used. It was an ambition realised to travel by TGV and the fare prices were not much different to the standard Grand Lignes service. Bicycles are carried at one end of the train, within a luggage compartment in one of the driving ends. Each carriage and seat is numbered so your ticket is for a specific seat unlike the Intercity service. 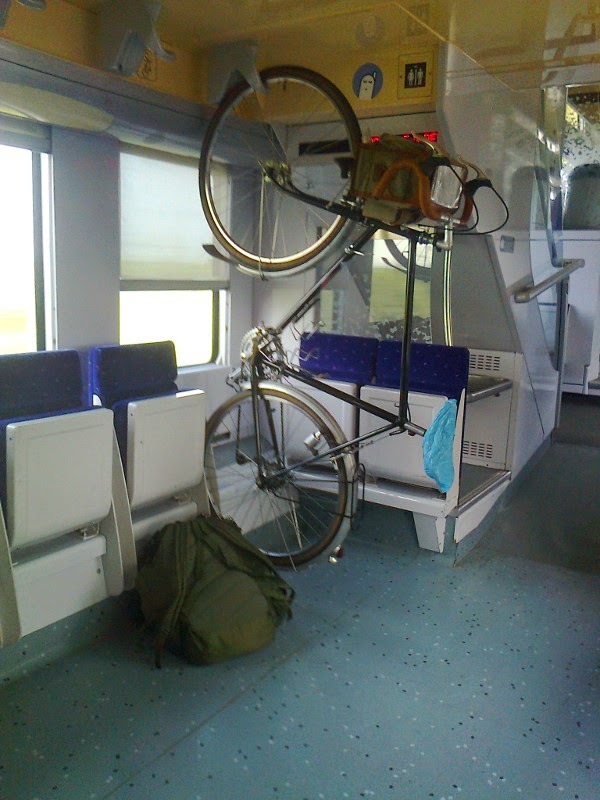 The bicycle space is limited in a TGV and your bicycle may be hung on a rack, but the space is also shared with bulky luggage or children's buggies, etc. This will have an effect on how quickly you can disembark from the train, so bear this in mind if you are rushing to catch another service from either the Gare du Nord or any of the other Paris railway stations. 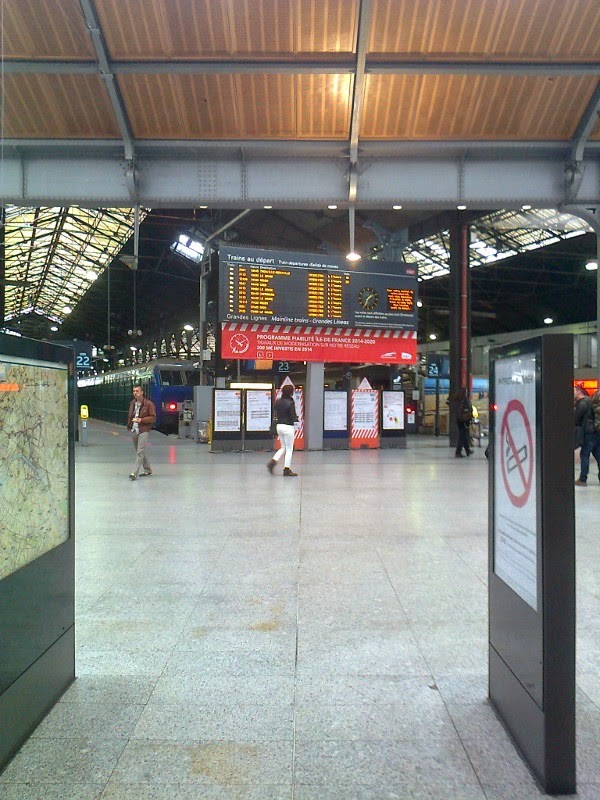 The TGV service from Valenciennes runs on local lines to Arras and then runs on the high speed line to near Charles de Gaulle airport where it slows down and uses the existing rail network into the Gare du Nord. I was catching another train from a different Paris railway station which required a cycle journey from the Rue de Dunkerque outside Paris Gare du Nord to the Gare St Lazaire. There is a cycle route using the bus lanes, but in my opinion requires some knowledge of the street layout between the two destinations. There is some signage but it is not as good as it could be, but again, it is a lot better than nothing. The biggest problem I had on the route was when I got to the Place d'Estienne d'Orves, where it crosses in front of the Eglise de la Trinite. There are a number of tourist buses which stop in front of the church and the road goes round the front of the church and then forks. The map I had was confusing, because it directed an immediate right turn on entry into the Place d'Estienne d'Ovres which is wrong and will take you onto Rue Blanche. You need to go round the front of the church and take the first left up the hill, (there was no street name visible at the end of the road), which is the Rue des Londres. From this junction you need the first road (as opposed to building entrances) to your left which should be the Rue d'Amsterdam which leads onto a tree lined square. There is a taxi rank along the side of the square and the entrance to Paris Gare St Lazaire is under a modern office block on the right hand side of the road. This is the best entrance to use as it is fairly level unlike the main entrance at the front of the station building which will require carrying your bicycle up flights of steps. 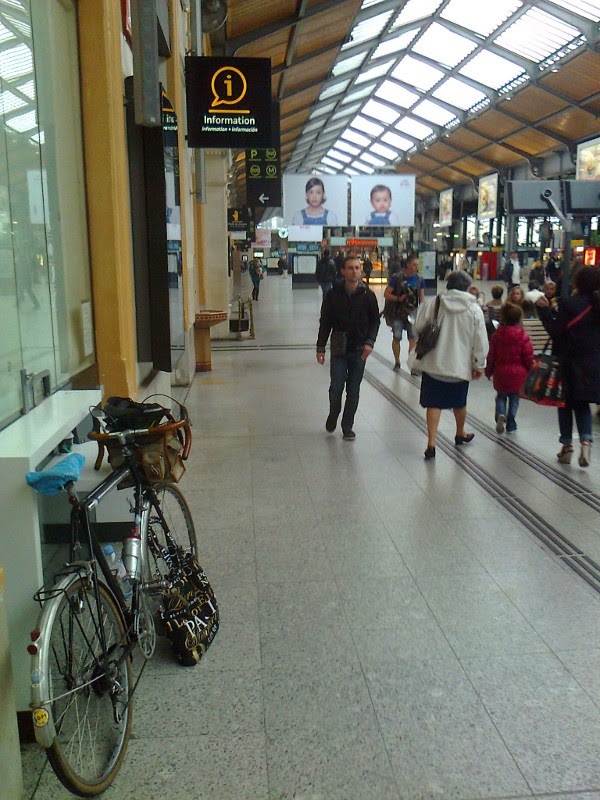 The entrance from the Rue d'Amsterdam leads straight onto the station platform concourse. I took the train to Cherbourg to catch the Rosslare Ferry. The first stop on the route was at Caen and we stopped at Carentan. There was a huge Stars and Stripes as well as the French Tricolour flying from the Hotel de Ville in Carentan ahead of the 70th anniversary D-Day commemoration. I will certainly return to explore the Cotentin Peninsular by bicycle at some stage. The railway station at Cherbourg is some distance from the ferry terminals. It is easily cycled but you will have to negotiate all the ferry traffic especially the heavy goods vehicles. If you don't have a ticket, one has to be purchased from the ferry office. 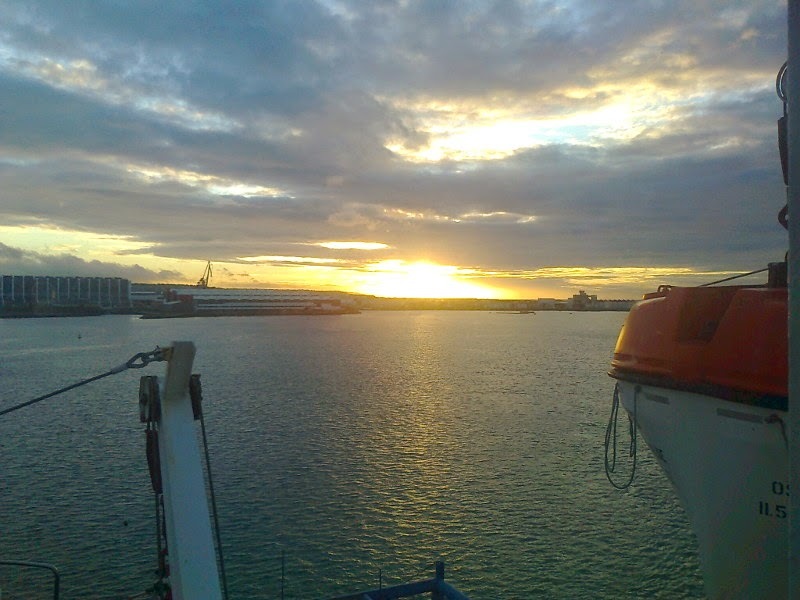 An overnight sailing got to Rosslare at 15.30 in the afternoon. I disembarked with the vehicular traffic and had a friendly greeting from the Gardai before exiting the ferry terminal. The railway station is now located outside the port boundary. 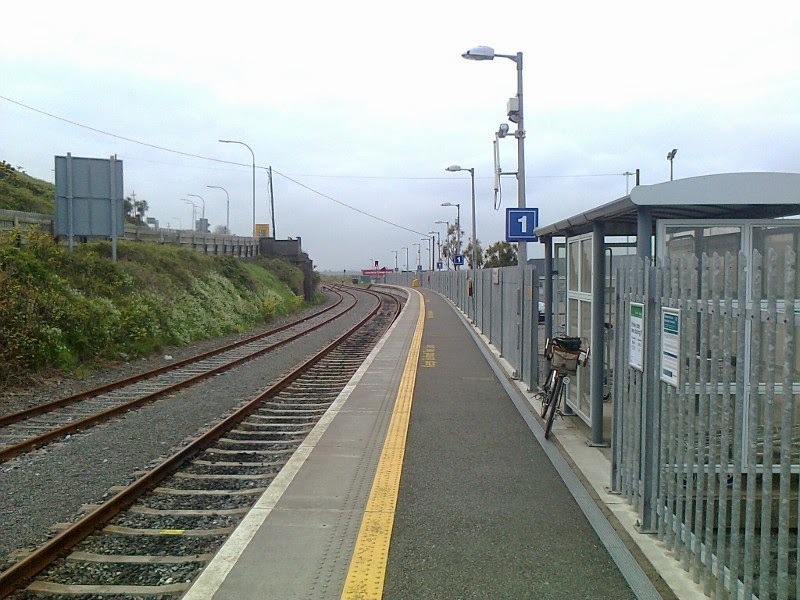 There is a limited train service from Rosslare northwards to Dublin and the service is often delayed by the suburban Dublin Dart trains enroute to Dublin Connolly station. I was able to make the connection with the Dublin-Belfast Enterprise and got the last 20:50 service north. Rail fares like France are very reasonable, E27.30 to Dublin Connolly , and £50.85 first class on the Enterprise Express with a bicycle. The railway staff in Ireland were as friendly and helpful as their French counterparts. An onward ride home from the railway station In Belfast to my overnight accommodation was problem free using the dynamo lighting before travelling home the next day. I will do it again soon.